Somewhere in the halls of NBC, an ad executive is looking at the high concept of Rick Remender and Eric Nguyen's new comic Gigantic and weeping openly. He's wondering just why he didn't come up with the idea of a superhero reality show where a brainwashed alien hero fights against a series of threats to the survival of Earth, all the time unaware that he's being filmed for the televisual pleasure of aliens from his home planet. Find out more about the series that its creators are calling "a reflection on America's consumer-based culture and the secret price paid by both the audience and the actors for a life filled with the endless distraction of entertainment" (plus, things being hit real hard and exploding!) under the jump. Visually, it's a modern take on the big dynamic power of Jack Kirby, merged with the scale of a ‘Godzilla' movie and sprinkled with 1950s sci-fi kitsch. 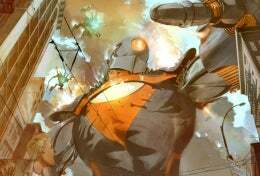 ‘Gigantic' will tap into what makes comics fun— big visually exciting pages and destruction on a scale never before seen... The series' initial thrust will be the slowly unraveling the mystery of who Gigantic is and why he's constantly being engaged in absurd and seemingly staged large-scale battles across our globe. Regardless of his attempt to stop the ensuing destruction and protect humanity, many of the attacks lead to the flattening of dozens of major cities across the globe, setting all governments to the singular task of annihilating this alien monster. As the size of the robots and bounty hunters sent to fight him continue to increase, so does the wholesale destruction of the cities of men. Gigantic's guilt and sorrow exponentially increase as he begins to realize that no matter where he goes, death and destruction inevitably follow him. The series - planned to continue indefinitely, running in blocks of five issues at a time - is aimed at an October launch.